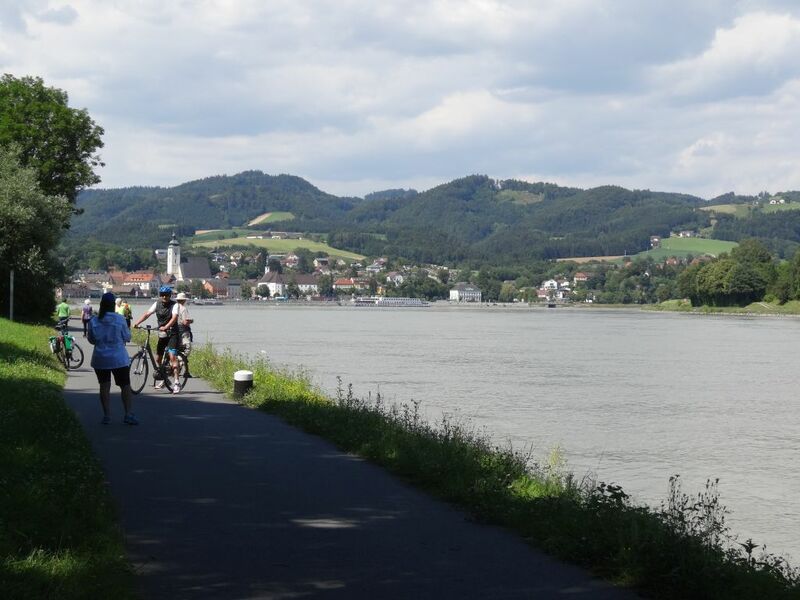 Thanks to Marie for this report about a Danube cycling holiday from Passau to Vienna. Saturday: Sitting on the huge terrace of our riverside Gasthof for a few hours enjoying a beer and meal in the warmth outside, as we’ve done every evening for the past week, and watching the golden sunlight move across the vines and fields on the hills opposite, we’ve been reviewing our 7 days of riding adventures with just occasional thoughts of how things might be at home. John’s been keeping his eye on the post – election circus, and was temporarily distressed by the footy result (I went for a swim to leave him space to cry), but otherwise our minds have been occupied with medieval, later and earlier periods of history, and the delights of travelling by bicycle. We woke to the sound of rain this morning and the forecast was worrying, but in 7 days we’ve had consistently dry weather and ideal temperatures. Today’s wind was strong and at our backs, so we raced along in top gear (I won’t divulge our average speed as some serious bike riders may read this) and have had plenty of time to explore various cities, towns and villages along the Danube. We’ve crossed the river countless times, by tiny ferry or on huge bridges, and today were really impressed to find engineering used skilfully to create a snail- like spiral pathway with ideal gradient for bikes which took us easily from river level to perhaps 100 metres up and bridge access. We’ve been constantly impressed by bike infrastructure, which has been virtually faultless in surface and width, signs all accurate and well placed, and so many people use the paths for everyday activities it’s marvellous to see. We’ve happened upon a number of outdoor concerts and festivals with an enormous variety of music – the versatility of musicians has been extraordinary, from community-based brass bands and choirs and dancers in traditional costumes to the folk in lederhosen playing Cuban dance music, and the lead singer of a group in a dirndl singing ABBA-style, Eurovision-inspired party songs. The town of Enns is supposed to be the oldest, but we were impressed to have a picnic lunch under a tree planted in1300, which is also on the World Heritage Listing. We pondered on the Venus of Willendorf,made and left in the soil 26,000 years ago to be found in recent times. Stayed in the lovely and quaint village of Mauthausen barely miles from the infamous camp, now a solemn and sobering memorial and surrounded by stunning countryside and estimated that 50people must have been cremated there every day for 7 years to hide their callous deaths. And also wonder why ‘Bad MoonRising’ seems to be on high rotation on local radio in Austria! It’s now Sunday night, and we’ve braved the busy streets of Vienna to reach our final destination after more than 300kms. But will be happy to be transported by subway for a few days now as we explore this fabulous but chaotic city – plenty of art and music to find here. This entry was posted in Cycle touring and tagged Cycling the Danube by hlyth2013. Bookmark the permalink.